Details: 5th Annual Judy V. Spencer 5K-9 2018 Overview The Judy V. Spencer Fund is proud to present the 5th Annual Bay City 5k-9 Race for 2018! 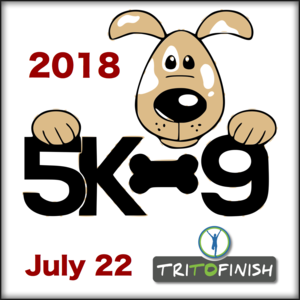 Join several hundred participants in running and/or walking with or without your dog on our 5k course located along Bay Citys beautiful Rail Trail. Yes! This IS a dog friendly event! The 5k-9 sign up will be held at the Bay City Community Center. Proceeds from this years event go to the Judy V. Spencer Fund which in partnership with the Bay Area Womens Center and the Humane Society of Bay County, provides boarding for the animals of domestic violence victims. We will be racing on a Saturday morning! This race has 2 starting times. We understand that everyone can't or doesn't want to run with dogs. For those who prefer not to run the race alongside our canine friends, there is a 9:00AM "NO DOGS" start. For those bringing their furry friends AND for those who'd like to participate alongside them, there is a 9:30AM "WITH DOGS" start. You do not have to bring a pooch to participant in the "WITH DOGS" event! This race is being organized and managed by TriToFinish and the Judy V. Spencer Fund with proceeds being placed back into the Bay City community through the Judy V. Spencer Fund. Course Description: Races will begin on John F. Kennedy Drive across from the Bay City Community Center. 5K Course Start at driveway by old house on JFK Dr., proceed down JFK until tennis courts then up on sidewalk follow sidewalk and turn right (East) at Marina until next possible right on sidewalk turn South and proceed down sidewalk and keep following until sidewalk takes a left, then right then follow riverwalk all the way (closest to river) to the boathouse and around the parking lot on the sidewalk and return to main sidewalk and follow to small foot bridge by arboretum, then turn left, follow sidewalk and finish in driveway of the old house. There will be a single aid station that dogs and their participants will pass twice - once on the way out and once on the return. Doggies will have water dishes to refresh themselves at! Packet Pickup and Late Registration: Saturday, April 14th, 2018 from 7:30-9:15* AM at Bay City Community Center * Those participants who wish to run or walk WITHOUT dogs, must complete packet pickup and be at the start line before 9AM. If you miss the start, please check in at the registration table to move your bib to the 9:30 WITH dogs start time. You do NOT have to have a dog to participate in the "WITH DOGS" event! The "NO DOGS" group was created for those who wish to race but do not want to run alongside dogs. Race Start Times 9:00 5K Run/Walk NO DOGS 9:30 5K Run/Walk WITH DOGS Awards Awards for OVERALL winners will be provided 3 deep to overall male and female winners of the 5K Run event WITHOUT dogs and 3 deep overall male and female for the 5K WITH dogs. Runners Athletic Company is providing COOL additions to prizes for the OVERALL winners with and without dogs: Leashes (for top male and female with dog): Stunt Puppy brand dog leashes allow you to run easily and hands-free with your dog by your side. Top male and female winner (running with dog) will receive a Stunt Runner leash. (Actual leash color may be different than shown) Shirts (for top male and female without dog): Puppies Make Me Happy brand t-shirts -- the "Happiest Clothes on Earth!" Top male and female winner (running without dog) will receive a "Puppies Make Me Happy" t-shirt. In addition overall winners will receive free entry to next years JVS 5K-9 Event in the category they win. 2nd Place overall finishers will receive 50% off and 3rd Place overall finishers will receive 25% off entry to the 2018 event. NOTE: All participants will receive high quality finisher medals at the finish line upon completion of their event! While age group results WILL be provided, this years event will NOT have age group awards to keep costs down as this IS a charitable event. Results Both actual and adjusted results from Miller Race Management will be displayed at the event and will be posted at TRITOFINISH.COM within 48 hours of race completion.